WASHINGTON (CNS) — If the saints, because of their sheer holiness, can sometimes seem hard to relate to, the life of Mary, the mother of Jesus, can seem even more distant. 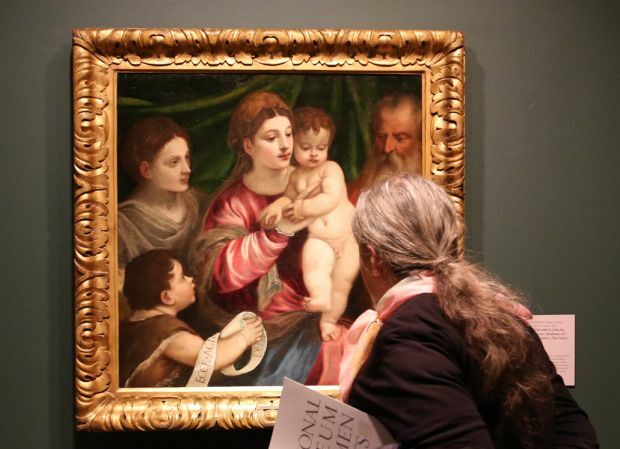 The works — primarily paintings but also some sculptures, textiles and etchings — are predominantly from Italian museums, churches and private collections, and many have never been on display in the United States. “Religious visitors will be deeply moved” by the exhibit, but it will also “speak to nonbelievers” about our universal experience and the importance of a mother’s embrace, said the exhibit’s curator, Msgr. Timothy Verdon, an art historian who was born in New Jersey but lives in Florence, Italy, where he directs the archdiocese’s Office of Sacred Art and Church Cultural Heritage and the Cathedral Foundation Museum. The priest, who led a group of reporters on a tour of the exhibit Dec. 3, did not hesitate to point out works of art that particularly highlighted Mary’s humanity. In some of the typical Madonna and Child poses, Jesus is either playing with Mary’s hands or her veil. One marble relief from 1340, originally on the bell tower of a church in Florence, shows a smiling Mary tickling a laughing baby Jesus. “It’s a miracle in its ordinariness,” Msgr. Verdon told reporters. Mary is shown barefooted, sleeping and about to breast-feed. She is often looking down at Jesus and in some works she is sad and contemplative. She sits on a throne, is approached by angels and sits on the ground in the two renditions of the Holy Family’s flight into Egypt, including one by Caravaggio where Joseph holds the sheet music for an angel playing the violin for the family. The works are also full of religious symbols. In a Botticelli painting, Mary is reading from Scripture or a book of prayers while holding the infant Jesus, or the “word made flesh” as Msgr. Verdon noted. The infant is holding gold nails in one hand and wearing a gold crown of thorns on his wrist. The priest said the symbolic items were likely added later by another artist. Another painting, with Mary holding Jesus with one hand and supporting a wooden cross with the other, also includes an angel holding a crown of flowers and a crown of thorns, depicting the “sweetness” of religious life and also the suffering that goes along with it, the priest noted. The special exhibit, which will only be shown at the Washington museum, was four years in the making and is part of a partnership with the Italian Embassy and The Catholic University of America, which is sponsoring a number of programs throughout the year related to the exhibit. In a Nov. 18 interview, she told Catholic News Service that the exhibit brings out “all the showstoppers” by great artists. One of her favorites is Rembrandt’s small etching called “The Death of the Virgin,” which depicts an elderly Mary in bed surrounded by onlookers, people praying, someone taking her pulse, children playing on the floor at the bed’s edge, and angels hovering overhead. “I have a soft spot for Rembrandt,” she said, noting his style of humility and sensitivity. To see an interactive display, visit http://nmwa.org/exhibitions/picturing-mary-woman-mother-idea.